Plagal of the Fourth Tone. O Lady, full of grace divine, you ever grant to me your grace's waters, which are gushing forth continually from your never-failing Spring, beyond understanding. You gave birth to God the Logos inexplicably, so I pray you that your gift of grace refreshes me, that I may cry to you, "Rejoice, water of deliverance!" Rejoice, O Spring of joy unending. Rejoice, O stream of ineffable beauty. Rejoice, termination of every malady. Rejoice, elimination of every suffering. Rejoice, clearest stream that gives believers their health. Rejoice, water that is abundantly joyous to those who are sick. Rejoice, water of wisdom, removing ignorance. Rejoice, potion for the heart, pouring forth ambrosia. Rejoice, bowl of manna overflowing with life. Rejoice, basin overflowing with nectar divine. Rejoice, for you point out the passing of illness. Rejoice, for you put out the fire of sickness. Pure Maiden, we know that the holy water of your Spring, more than all other water, is most excellent indeed, for it pours forth supernaturally, and it relieves us of serious illness, clearly restoring good health to our souls. Behold, we all see now the new Siloam of your Spring, which, O Virgin, delivers people from infirmities. Eyes of a man who was blind are restored. We, in addition to life, are receiving good health and vigor continually. All you who are seeking your health now run to the Spring. 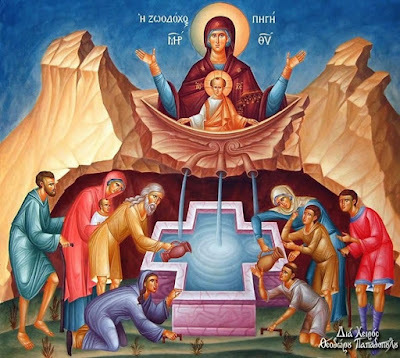 For the grace of the Virgin does within the water dwell. Greatly rejoice, O believers, and exult, for you will have the appropriate answer to your requests in her sacred shrine. The water of your Spring is exalted higher than the sky, and its streams permeated all the oceans of the earth. It is indeed the ambrosia of the soul, nectar of the faithful honey from the rock, and manna that rains down on us.